Chris Marker’s preference for still shots in lieu of live action sequences produces an uncanny cinematic effect. In the two or three seconds of pause that follow every refreshed image, the viewer is granted enough time to absorb the shock of the image. In contrast to Marker’s form, the stream of conventional moving cinema interrupts the moment of reflection. A sequence following the destruction of Paris: the camera follows foreign (German) scientists as they operate in the sewers of the city. One of them, a tall man with drawn cheeks and a moustache, is the subject of a sequence of six or seven images (ten – fifteen seconds). The first image arrests him in profile. He bears a momentary likeness to Nietzsche. The next image he is shown head on and lit form above. The recesses in his face sink out of our field of view. He looks like a skull. Then an ape. Then the remnants of a skull. Marker’s style emphasizes a latent montage effect that hides in narrative cinema. The above character in the sewer is suddenly endowed with death, with evolution, with the over-man (who else could face the world in the aftershock of nuclear catastrophe?). Each of these furnished aspects colour the character, they texture the narrative. These fragments of time could be encompassed within a moving picture (at T1, T2, T3 taken as stills, or slices of time) but the discreet quality would be lost, or covered over. 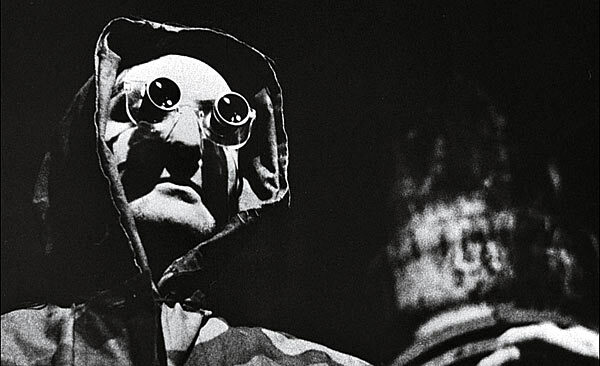 There is something in the rhythm of La Jetee which brings these senses to the surface. Dave pregnantly observed that conventional film is itself composed of sequential images. Whereas Marker’s images unfold at a rate of 0.25/second, conventional cinematic images unfold at a rate of ~24/second. There is some point between these rates where the discrete gives over to the continuous. In Andre Breton’s Nadja, it is said that ‘I am the ghost of who I haunt.’ Marker’ protagonist haunts fragmented memories and images.